Waterfall is a project management approach where a project is completed in distinct stages and moved step by step toward ultimate release to consumers. You make a big plan upfront and then execute in a linear fashion, hoping there won’t be any changes in the plan. When you take traditional project management and apply it to software development, you get Waterfall. As such, no one invented waterfall - instead, we gave it name once we realized that there are others ways to manage projects (like agile project management). 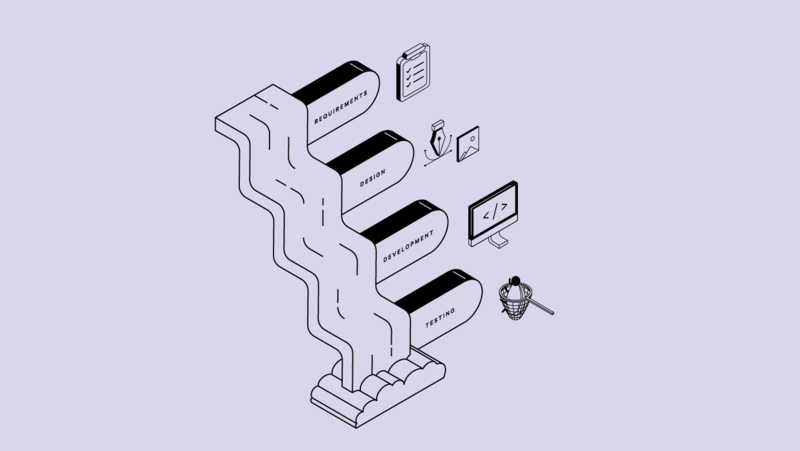 Waterfall was the first software development methodology, inherited from manufacturing and construction industry where you can't afford to iterate (after you've built a tower or a bridge you can't go back to "improve" the foundation). But because the software is prone to frequent change, the waterfall is not the best solution. Waterfall is often mentioned alongside Agile and stands in contrast to it. The main difference between them is that waterfall doesn't react well to frequent changes, which is why it gets a bad reputation in the software development community, where frequent changes are the norm. Once you put all the activities on a Gantt chart, you get something that looks like slopes of a waterfall, hence the name. Usually, 20–40% of the time is spent on requirements and design, 30–40% on coding, and the rest on testing and operations. Activities on waterfall projects have to happen in the exact order and one set of activities can't start before the previous one ends. 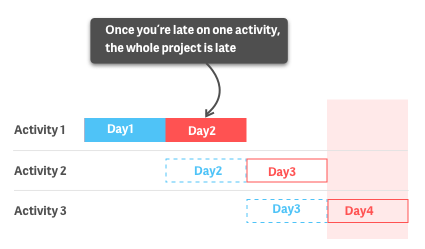 This is why planning is the most important thing on waterfall projects: if you don’t plan right, a phase will be late and will push every other subsequent phase, thus putting the whole project over deadline. The problem with using waterfall method on a software project is that planning is very tricky in software development. You can never be 100% sure how much time you'll need on something or how much time you'll spend debugging. As a result, the waterfall is risky. 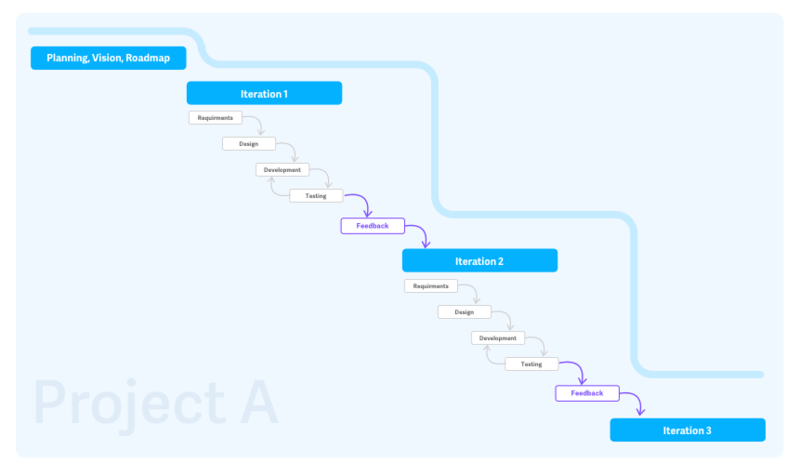 Because you can't go back to a previous activity, you're forced to create comprehensive documentation from the start, listing all the requirements you can think of. When you have extensive documentation, knowledge won't get lost if someone leaves. Also, you don’t have to spend time on training new members as they can familiarise with the project by reading the documentation. Because everyone knows in advance on what they'll work, they can be assigned on multiple projects at the same time. Waterfall projects are divided into discrete and easily understandable phases. As a result, project management is straightforward and the process is easily understandable even to non-developers. Clients can know in advance the cost and timeline of the project so they can plan their business activities and manage cash flow according to the plan. After the requirements phase, client input is minimal (save for occasional reviews, approvals, and status meetings). This means you don't have coordinate with them and wait for when they're available. Because waterfall projects are simple, it's much easier to measure your progress by quickly looking at a Gantt chart. Products have a higher cohesion because during the design phase you know everything that must be taken into account. There is no one-feature-at-a-time problem that leads to usability problems down the road. Once you're finished with one activity, it's difficult and expensive to go back and make changes. This puts huge pressure on the planning. Everything relies heavily on the requirements phase and if you make an error, the project is doomed. Once one activity is late, all the other activities are late too, including the project deadline. Testing is done at the end of the project which means that developers can't improve how they write code based on QA feedback. Because the testing is done at the end, most teams tend to rush the testing in order to deliver the project on time and hit their incentives. These short-term wins lead to sub-par quality and long-term problems. Most of the time, clients can't articulate what they need until they see what they don't need. If the client realizes they need more than they initially thought, the project plan will need a major overhaul (as well as the budget). Designers can't foresee all the problems that will arise from their design, and once those problems surface, it's very difficult to fix them. Whether you'll use agile or waterfall doesn't matter on your preference but type of project and your customer/client. While strictly speaking agile is better for software development (see the statistics here), if you can't iterate, you have to use waterfall. Waterfall is always mentioned as the antithesis to Agile, which makes sense. After all, waterfall projects have a hard time dealing with changes while agile projects welcome change. At least in theory. The truth is, no matter what methodology you use, change is not a good thing. Change always means additional scope, delay, and expenses. Agile is better at minimizing the effects of change, but they still happen. Also, agile teams have the culture where change is OK, which is maybe the most important benefit of being agile. But once you scratch behind the surface and look both from purely process perspective, the waterfall is very similar to agile. Once you break down any agile workflow, you'll still get a set of activities that follow one another, which eerily resembles Waterfall. 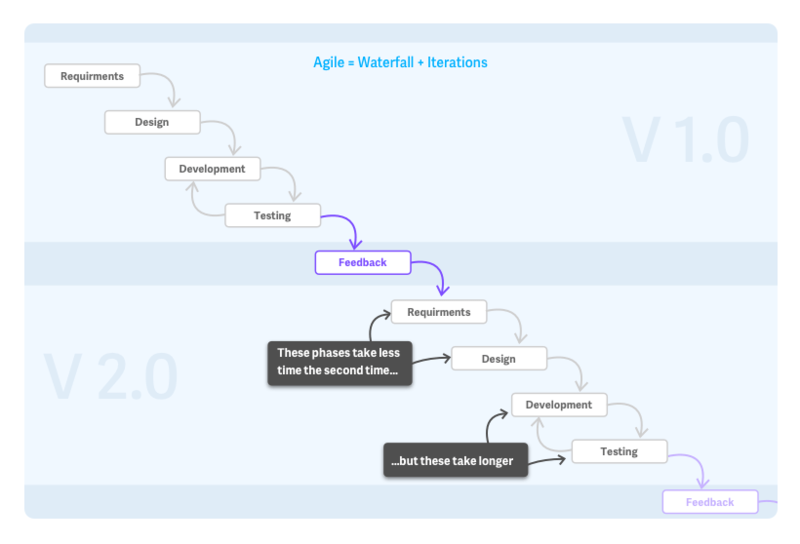 And if you treat waterfall projects as smaller phases within a big project, you'll end up with agile. In other words, activities on a project are a waterfall and if you treat the whole project as a series of iterations, it’s agile. Whether you're agile or waterfall ultimately depends on whether your client expects the first version to be bad. And waterfall projects are projects where the client decided on zero iterations. As you can see, agile still fits in the traditional project management, only the point of view changes. Instead of treating each iteration as a separate project, iterations are just phases in one big project. The real difference between the waterfall method and agile is that in the waterfall the clients is heavily engaged at the beginning of the project and then their engagement declines; while in agile, the client is constantly engaged. So what this all means in practice? It means no organization is purely agile or waterfall. Agile and waterfall are more about the culture and type of work the organization does than how they do it. You’ll find that most organizations divide the project into waterfall milestone but work according to agile principles between those milestones.